Prime Minister Narendra Modi reached out to farmers today on his NaMo app. New Delhi: Prime Minister Narendra Modi today said the government is taking massive steps for reforms in the agricultural sector and reiterated the pledge to double farmers' income by 2022. The outreach to the farmers of Karnataka -- broadcast on the Prime Minister's NaMo app -- came amid a huge agrarian crisis, resulting in farmer suicides and protests across the country. Calling farmers "anndaata" (one who provides food) the Prime Minister said they are "supreme" and listed the steps the government has taken for their welfare. Assembly elections will be held in Karnataka on May 12 and the BJP is going all out to wrest the state from the ruling Congress government led by Siddaramaiah. 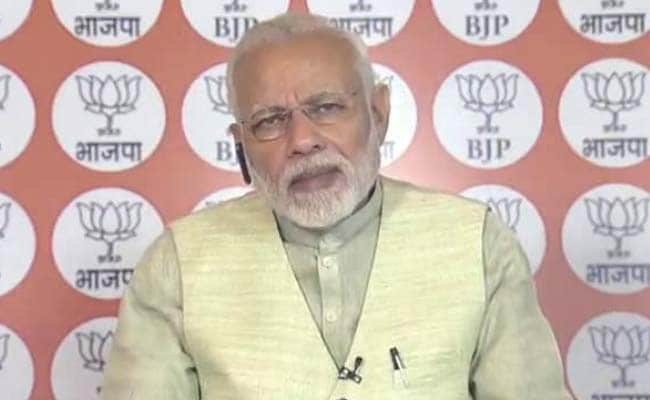 "We have to convince farmers to bring a government that is sensitive to their issues," the Prime Minister has told his Kisan Karyakartas (farmer workers) of the BJP's farmers' cell. The government has undertaken a layered approach to shed its anti-farmer image, which the opposition Congress has been trying to benefit from. Last month, the government started the 'Gram Swaraj Abhiyan' -- a countrywide initiative - to connect with scheduled castes and tribes and farmers. The ongoing 'Kisan Kalyan Karyashala' (farmers' development workshop) is a part of it. "Due to the apathy of Karnataka government, farmers in the state have not got the benefit of 'Fasal Bima Yojna'. A sensitive government, which works for the development of farmers, is needed in Karnataka," the Prime Minister told the farmers today. "The Congress only knows how to manipulate the people and play politics with farmers," PM Modi said. "They didn't take any steps in Karnataka when lakes and water bodies were drying up. They gave the dried up land to builders... They (the Congress) go and mislead the farmers, manipulate and spread falsehoods," the Prime Minister said.